No, actually it isn’t. I’m going to immediately qualify that statement…A well made bar of handmade soap is not harsh. This summer we have been supporting a new local Community Market by selling our products there. It has been an extremely valuable experience, as it has allowed me to meet our customers face to face, which doesn’t happen very often when you only do online and wholesale orders. Aside from hearing what people would like to see in our lineup, the most valuable thing for me has been hearing what their concerns are. The most prevalent concerning handmade soap is the belief that it is harsh and hard on your skin. First I’m going to talk about why so many people believe this, then we’ll look at why this belief is incorrect. When most people are asked about handmade soap, they think about the lye soap that our grandmothers (or great grandmothers) made at home. 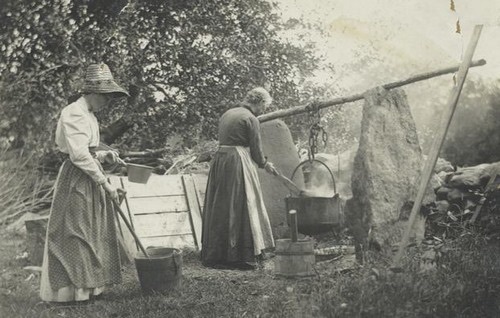 The ingredients were rendered fat from the cows or pigs that they butchered for food, and lye made from wood ashes produced by the wood stoves used to heat their homes. The process was simple: throw wood ash into a pot, fill it up with rainwater, let it soak until an egg dropped into the water floats with about 1/4 of its surface above the water. Strain the ashes out and use the remaining solution to make soap. 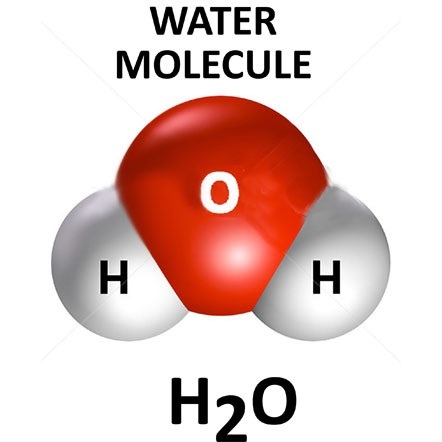 Each hydrogen atom has the ability to attract and hold two oxygen atoms, giving water the chemical formula of H2O. In this same fashion, when we make soap, the individual atoms of fatty acids that make up the vegetable oils pair off with the sodium (NA), oxygen (O), and hydrogen (H) molecules that form a molecule of lye (NAOH), forming two new molecules, soap and glycerin. If we used olive oil, we would have roughly 1 molecule of glycerin for every 3 molecules of sodium oleate (olive oil soap). Still with me? Back to our grandmother making soap. With no way of measuring how strong the lye was, ie how many molecules of lye were in the lye and water solution, there was no way to measure how much animal fat she would need to add to pair off with, thereby neutralizing or consuming, each molecule of the lye. More often than not, the end product contained free molecules of lye within it. Lye is a caustic substance, so this active lye would sting and burn the skin when the soap was used. So it wasn’t the handmade soap that was harsh, it was the unneutralized lye suspended within the bar of soap that caused the problems. Fast forward to now: lye is commercially produced by passing an electrical current through either sodium chloride (salt) to produce sodium hydroxide, or through potassium chloride (potash) to produce potassium hydroxide. The end product is 100% pure lye (plus some other substances that aren’t used in soapmaking), which allows us to calculate precisely how much of any individual vegetable oil or animal fat is required to consume one molecule of lye. Each oil has a different chemical composition, so the amount of lye required to saponify (change to soap) one gram of olive oil is different than the amount required for one gram of coconut oil. Modern soap makers use special lye calculators to create our recipes. Each type of vegetable oil contributes different qualities to a bar of soap, and we spend a great deal of time coming up with the perfect blend. Once we have that blend perfected, the lye calculator will tell us exactly how much lye and water we need to add to our batch of oils to convert every molecule of oil to soap and glycerin, and leave no lye in the finished product. However, we don’t stop there! We add extra oils to each batch. This is called ‘superfatting’. Superfatting our soap does two things: it ensures that we never have any lye left in our soap, even if our scale is out of balance resulting in small discrepancies in the amounts measured, and it leaves a small amount of unsaponified oils in the finished product, which leaves your skin feeling lightly moisturized after your shower. So that is why modern handmade soap is not harsh. This is not your grandmother’s soap! 3) You may have extremely sensitive skin. While most people with skin conditions such as eczema, psoriasis, rosacea etc can use a fragrance free handmade soap, there are some who cannot. Try a bar of authentic Castile soap made with 100% olive oil, which is the gentlest soap,and if that doesn’t work you should probably stick with synthetic cleansers such as Cetaphil. One final comment on lye: there are two types of lye, potassium hydroxide, which our grandmothers made, is now used to make liquid soap, sodium hydroxide is used to make bar soap, and a blend of the two are used to make cream soaps and most shaving soaps.